Hand grenades are these little bombs that soldiers carry, usually within easy reach, that used correctly are meant to be tossed at an attacking enemy, thus saving not only the life of the soldier but his buddies. They can also be used for self-destructive means, killing one's self, or even as a suicide bomb – killing not just one’s self but anybody close enough to feel the blast. To get an idea of this kind of destruction all you have to do is go watch Letters from Iwo Jima - some of the more recent, harsh images of this use of hand grenades. I’ve found another form of hand grenades. These are the metaphorical kind, but almost nearly as destructive. A friend and I were talking the other day about relationships and the ways we sometimes surprisingly find ourselves doing whatever it takes to end them when a button gets pushed, or the Significant Other gets too close. I mentioned it is like standing there in the moment with a hand grenade, finger in the pin, ready to pull. For her, it’s the response she gets from him just as she is suggesting they should end it that stops her dead in her tracks, causing her to take her finger out of the pin, and put the grenade away. His response is a grace that says, “I see what you are doing and no. We will push through this together. I am not going anywhere.” She’s not expecting that kind of response so of course it gives her pause to consider what she was getting ready to do. My version of this sabotage can be carried out with no one around, and it is the anticipation, the possibility of something I am not sure I can handle that provokes me to reach for my grenades, and pull the pin. I talk about it as a grenade because it isn’t usually on a large scale, and it isn’t intended to hurt anyone but myself… it’s just that anyone standing close by gets shrapnel from the blast. It’s not large-scale sabotage. 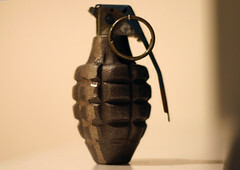 What catches me off guard is the fact that I carry these metaphorical grenades with me as if it is normal. My guess is you do too. Look at it this way: if you were dating somebody and they met you for dinner wearing a vest full of bombs, wouldn’t you think it strange? And they sit down order and start talking to you as if nothing is a matter, what would you do? The normal response would be to leave immediately, clearing out as many people in the restaurant as possible. And lets’ not even talking about getting close, getting intimate…why would you, one of them might go off! Unfortunately, we aren’t that obvious. These things usually aren’t seen or heard until they go off, until the relationship has something to lose. It is a grace to see grenades for what they are, to maybe even ask me if I might put them down, get rid of them; to ask her why she carries them in the first place; to stay with him at the table loving him enough to help remove the vest. Remember, these are used as a means of self-preservation… and they aren’t easy to throw away.